Constance grew up on a farm in Virginia. A graduate of the School of Fine Arts, Yale University, she worked as a freelance commercial artist, raised four children, and as soon as it became viable, devoted herself full-time to serious painting. Ms. Kiermaier is a collagist, box maker, printmaker, painter and teacher. Her work has been shown throughout the east coast, New England and New York City. In New England, some of the places where she has been represented include the Mattatuck Museum, Waterbury CT; Rhode Island School of Design, Providence, RI; Silvermine Guild Arts Center, New Canaan, CT; The Mills Gallery, Boston, MA; and Yale University, New Haven, CT. In New York City, she has had four solo exhibits at SOHO20, and has been included in group exhibitions at G.W. Einstein, the Genesis Gallery and the National Academy of Fine Arts. In Maine, where she has spent her summer for many years, she has exhibited at the Maine Center for Contemporary Art, Rockport; Between the Muse, Rockland; The Drawing Room, St. George and the The Portland Museum Biennial. Ms. Kiermaier is the recipient of many awards including the Faber Birren Award for Distinctive and Creative Expression with Color, and in 1993, she received a fellowship grant from the New England Foundation on the Arts/National Endowment for the Arts. In 2003 she was awarded a grant from the Weir Farm Foundation. Constance was a resident of Westport, CT for many years. 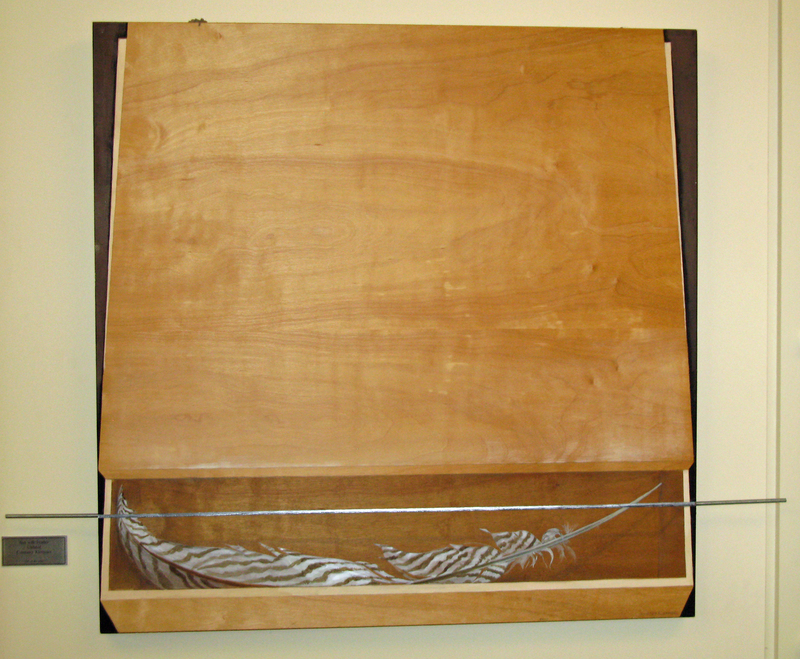 She now lives and maintains her studio in Norwalk, CT.
Kiermaier, Constance, “Box with Feather,” Westport Public Schools Digital Collections, accessed April 24, 2019, https://collections.westportps.org/items/show/1058.